The moment one reads Jane Gallop’s book, The Deaths of the Author, is the moment one becomes an author. Such banal description about engagement and creative exchange between work and reader has become something of a truism since Roland Barthes penned what Peter Wollen once described as his “squib-like” essay, “The Death of the Author.” Although Barthes took up similar theoretical terrain in his article, “From Work to Text,” it is “The Death of the Author” that resonates–if not for its critical concept, then certainly for its “militant, elegant slogan” (Gallop also refers to the “slogan” as “world-renowned,” a “postructuralist catchphrase,” “theoretical,” “familiar”). Indeed, the renown of Barthes’ memorable title has been such that it has come to obscure the complexity of the problem it originally named, reducing his description of a rich relationship to a dull defense of personal interpretation. Gallop wants to remind us that matters are not, and never were so simple. Nevertheless, Gallop must necessarily return to and raise the specter of Barthes, and the sloganism that attends his “renowned essay.” Revisiting this by-now familiar trope re-engages the authorial-reader experience, an experience that is resonant with a sensual-ness precisely because of the author’s death. Her return, then, depends on the obligatory (yet, thankfully brief) historical detour around the oft-paired essays, Barthes’s “The Death of the Author” and Michel Foucault’s essay, “What is An Author?” Gallop thus begins her book by rightly pointing out that these two writings are the ‘go-to’ texts where critical authorship discourse is concerned. If one essay ostensibly kills off the author, the other is more properly read as a discursive recounting of authorial practices in Western commodity culture. Gallop is also right to note that neither of these well-rehearsed (arguably, over-rehearsed) articles do away with the author as such. Foucault is easy to defend on this count because his essay makes clear that he is not declaring the author dead; the essay’s title, in fact, poses a question about the author’s existence as discourse, not its annihilation (he is asking, after all, what is an author?). Barthes’s offering, however, requires a more attentive and close reading. For Gallop, “to go back and reconsider the death of the author” (4) requires “a slow, detailed reading” (39) because, at its heart, The Deaths of the Author tests Barthes’s provocative claims. The details are significant. To move slowly is not only a stylistic turn; it is, for Gallop, a theoretical imperative. When, for example, in Sade, Fourier, Loyola Barthes calls for a “friendly return” to the author (not long after penning “The Death of the Author”), Gallop works through Barthes’s seductive suggestion in order to deliberately account for his “friendly return” to the author’s writing, death, and body. Reading Gallop’s beautiful and effective work, therefore, one becomes acutely aware of the critical significance “close reading” has, even if it has lost favor in the humanities. Thankfully, Gallop avoids this academic current when she proceeds deliberately, critically, and attends to Barthes’s and others’ writings with precision. In so doing, she realizes the authors’ deaths as a giveness to life: “The author returns from the world of the text to life, but if the return is a return from the dead, the life returned to is not the author’s but our life. The author returns to us” (39). As I write these lines two thoughts come to mind (I raise a third below). First, I am curious about Gallop’s returning author insofar as it evokes the Parousia, a second coming. What are the implications for raising a theological specter in this discussion? Second, what sets Gallop’s argument apart from other readings of Barthes’s noteworthy slogan? In other words, does her study resist the more reductive claims about the death of the author mentioned above? She writes, for example, “The author returns from the world of the text to life, but if the return is a return from the dead, the life returned to is not the author’s but our life. The author returns to us” (39). If “the author returns to us,” is this not similar to the suggestion that “the death of the author” gives way to the reader, “to us”? As such, in what way does Gallop’s close, slowly engaged, and sensual reading return the author to us in such a way that does not split the difference so neatly? The authors Gallop selects to sort through this task are in no small part crucial to reimagining the implications of death and the author/reader experience. They have all addressed this dynamic in one form or another. Although others explore these sensual and porous boundaries, Gallop provides a turn on the Freudian-Derridean mystic-writing pad through and upon which authorial traces remain and emanate. Gallop, for instance, closely touches on the textual hauntings that Derrida and Spivak evoke. A key instance both authors share is that they bring to life Marx in such a way that “treats [him] as a dead-but-still-going author” (16). Through the “dead-but-still-going” Derrida and Spivak resurrect the dead or, more accurately, they revive the non-dead. In Gallop’s account, the author and reader for Derrida and Spivak are not dislodged from one another. Rather, the reader is entangled with the author, or with the one who is always already “dead-but-still-going” (Does a “post-Marx” moment really exist?). Spivak—who, as I write this review, is the only author about whom Gallop writes that is “still with us”—grasps the anxiety of the “writing present.” That is, Spivak urgently writes in such as way as to be perpetually catching up. Her endless endnote “updates” reveal “the exasperation, the sense of futility” that are crucial to the way we understand her “continual revision” (128). Spivak’s writing is the critical wrangling with an aporia. Her “writing present is, to be sure, vanishing, but it is also, nonetheless, persistent” (128); it reaches for the possible in the impossible. While this brings us back and around to the matter of second-comings, the ‘persistency’ to write (for which Derrida and Spivak are recognized) rings peculiarly queer. The theological Parousia-effect is thus rendered perversely in The Deaths of the Author. Not insignificantly, Gallop’s book “is a reconsideration of the death of the author in the era of queer theory” (5). The connection between “queer” and “theory” in The Deaths of the Author is “palpable” since the critical necessity to think theoretically for queers is not only phenomenologically essential but also politically essential. Queer theory undoubtedly remains one of the few academic outposts where the stakes for life and death are not only crucial to how one thinks about so-called LGBTQ progress; “queer theory” (more vitally, I think) wrestles with the limitations of language to express the inexplicable experiences that make queer lives and deaths queer. The Parousia when offered through queer theory, therefore, does not merely evoke the second coming. Even in death—nay despite death and those who wish it dead—queer theory comes again and again. Gallop realizes this point saliently when she conjoins the authorial shadows in the “continuing moments” that Eve Kosofsky Sedgwick, Craig Owens, and Michael Lynch share at once across and through their writing. At stake are precisely their (anticipated) queer deaths: Owens and Lynch will die from AIDS; Sedgwick from an “unexpected diagnosis” of cancer (110). The hinge on which Gallop recounts Sedgwick and Owens’s relationship is pivotal for how we envisage and render the writing about inexplicable queer desire (I think about “writing” here along the lines that Derrida draws where écriture conjures cinematography, choreography, and so on). Sedgwick’s “relation to Owens is in fact a relation of reading and writing.” They discover one another through books in a bookstore. Gallop’s telling of this encounter is especially tantalizing for my cinematic mind since “[Sedgwick and Owens’s] relationship starts when Sedgwick reads an essay” by Owens in the bookstore. She reads in this public space that the “openly gay” writer “singles out [her] 1985 book Between Men for praise” in his essay, “Outlaws: Gay Men and Feminism” (94). Through, as Sedgwick puts it, “this strange, utterly discontinuous, projective space of desire, euphemistically named friendship, lost at a distance, or even just reading and writing,” the “touches of a body” unfold (quoted on 93). Surprisingly, Gallops quickly brushes by (in one of the few hurried moments in the book) the bookstore as place and the “palpability” this holds for Sedgwick and Owens’s relationship. 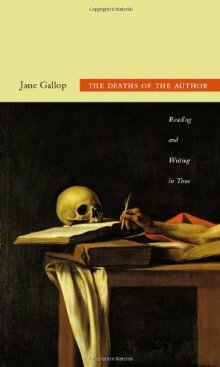 Indeed, while Gallop reiterates temporality as central to the “writerly perspective on death,” she neglects what is only hinted at in The Deaths of the Author: space. “This strange and projective space of desire named reading and writing” is but one of the few remarks on space (96—emphasis in original). The all-too brief nod to space makes me wonder what Gallop thinks of Sedgwick’s later insistence (and I choose this word carefully) in Touching Feeling: Affect, Pedagogy, Peformativity where she asks queers not to forget or to reject queer spatiality at the expense of queer temporality. Like “the death of the author,” “queer temporality” has reached saturation due to lusterless overuse. It is in the context of talking about AIDS that Sedgwick embraces the anachronism of the printed word. A decade earlier, it is in this context of mourning gay men dying young that Sedgwick come to value, not the ‘culture of the moment,’ not keeping-up-to-date, but holding on to what has passed. It is this experience of mourning, I suspect, that transforms her relation to the temporality of writing . . . While the writer may go about revising and updating, the printed word is the province not of the writer but of the author. The printed word, necessarily anachronistic, is where the writer confronts her status as a dead author (113-14). Across time, the dead author’s mark lingers, resonates, and queerly touches what has passed—for author and us. Where does this leave us? To what extent does Gallop guide us through a new turn on “the death of the author”? To what extent does her reading make perverse both the literal stamping-out (stomping out?) of the authorial gesture and its theological transcendence? Authorship—the malleable yet formidable creative dynamic where author and reader co-mingle—is, I argue, perceived by Gallop as the necessary work involved in expressing the seemingly inexpressible. Gallop’s close readings in and around queer lives, the “fragments” that the “dead-but-still-going” author leaves behind, elegantly invite us into the traces, ghostings and shadows that viscerally render the imbrication between the theoretical and the personal–a dynamic often disregarded in many academic circles. “Taken together,” Gallop writes, “our four chapters aim to revitalize the overly familiar death of the author so that we take it as both-theoretical-personal—so that we can take a fuller measure of its moving and unsettling effects on the reader and writers, on reading and writing” (18). Queers have long known that Barthes’s “The Death of the Author” was not meant as a guidebook to liberate the reader from the writer; it is an “unsettling” contribution. Such delusions of democratic grandeur have proven time and again to ignore the ideological trappings capitalism lays bare in the culture industry (Foucault spells this out most clearly with the “author-function” concept). Gallop, like queers before her, recognizes a more perverse and vibrant fantasy for Barthes’s “death of the author.” Again, hinging on a fragment, Gallop “linger[s]” on Barthes’s “extraordinary and perverse fantasy: ‘If I were a writer, and dead, how I would love it if my life . . . could travel outside any destiny and come to touch . . . some future body” (48—emphasis in original). She is “compelled by this fantasy” not because of “biography.” Rather, she “glimpse[s]” a “slightly twisted, somewhat displaced fantasy of a reader’s connection to the author” where the “fantasy of bodily touching” occurs (48). By writing Barthes (then Derrida, then Sedgwick, then Owens, then Lynch, and then Spivak), Gallop breathes life into the future-perfect corpses that are never really dead as such in the first place. The Deaths of the Author conjures a corps de ballet in which Gallop cinematically choreographs shadows and bodies so that in their performance they commingle. I am thankful for the invitation to dance. Wollen, Peter. “The Auteur Theory: Michael Curtiz and Casablanca.” Authorship and Film. Eds. David A. Gerstner and Janet Staiger. New York: Routledge, 2003. 61-76. Print. David A. Gerstner is Professor of Cinema Studies at the City University of New York. He most recent book is Queer Pollen: White Seduction, Black Male Homosexuality, and the Cinematic (University of Illinois Press, 2011). He is currently coediting an anthology with Cynthia Chris entitled, Media Authorship (Routledge).